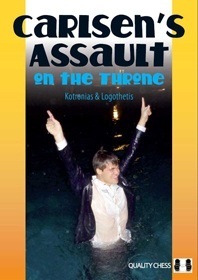 "Kotronias' notes are clear, to the point, and full of energy without being artificially dramatic. I think the balance he strikes is perfect for the reader who is a fan but still wants to learn something." "Carlsen's Assault on the Throne has much to recommend: insider commentary, deep analysis, and full-color photographs, almost everything you could ask for in a tournament book. Let's hope we see many more like it in the future! My assessment of this product: 5/6 stars"
"The London Diaries is a welcome addition to the book. It deals with the Candidates tournament - Carlsen's door to the throne room - and the exciting race with Kramnik, ending in two unlikely defeats in the final round. All 10 games in the match for the world championship are given the full treatment, with introduction, photos and extensive notes ... all making for an excellent permanent record of the event." "Excellent analysis and extensive background reports provide an enjoyable read... Carlsen 's Assault on the Throne is an excellent tournament book about the World Chess Championship 2013 which is on par with Bronstein's Zurich 1953"